The FOKKER company is part of the British GKN group and is a major player in the design, manufacture and technical support of cable harnesses used in civil and military aircraft. On 20 March 2018, at the FOKKER plant in Hoogerheide in the Netherlands, during a reception organized for its most important suppliers, Michiel Barendse Vice President & Managing Director of FOKKER ELMO presented the "Superior Excellence Award" for the Best Connector Supplier 2017 to Patrice Cavelier-Bros, President of Esterline Connection Technologies SOURIAU-SUNBANK. Michiel Barendse declared how delighted he was to be able give the prize for Best Connector Supplier to SOURIAU for the second consecutive year and went on to say "this trophy, which is a recognition of SOURIAU's excellent performance, is based on a working relationship that has long been established between our two companies." In fact, FOKKER and SOURIAU's collaboration has continued uninterrupted over the years, and has even been strengthened by regular exchanges of commercial, technical and logistical information, always with the objective of reaching the level of operational excellence that FOKKER needs to satisfy its customers. With an OTD service level of 97% and a PPM of 54, SOURIAU has succeeded in maintaining a high level of performance. FOKKER is also very attentive to the fact that SOURIAU has voluntarily committed to respecting the European REACH regulation and already has concrete solutions in place. SOURIAU's knowledge of international regulations and the flexibility the company has shown in adapting to the variations of FOKKER's industrial programs are decisive factors as well as the continuous flow of information on new products and the joint development of connectors. Patrice Cavelier-Bros, President of Esterline Connection Technologies SOURIAU - SUNBANK, expressing how honoured he was to receive the trophy for Best Connector Supplier 2017, made these closing remarks at the ceremony: "Receiving the trophy from FOKKER two years in a row is a reward for all the teams at SOURIAU, who are always striving to maintain the level of quality and service that FOKKER needs. This is made possible because in the course of the last ten years we have created a true partnership between our two companies, a partnership based on a mutual trust which grows stronger every year. If we have been able keep our commitments to FOKKER, it is also because at our strategic meetings your teams provide us with precise information on your production ramp-ups and future programmes. Under these conditions, because we are well informed, we can put the necessary manufacturing resources in place and plan our long-term investments so that we can maintain a high level of service. 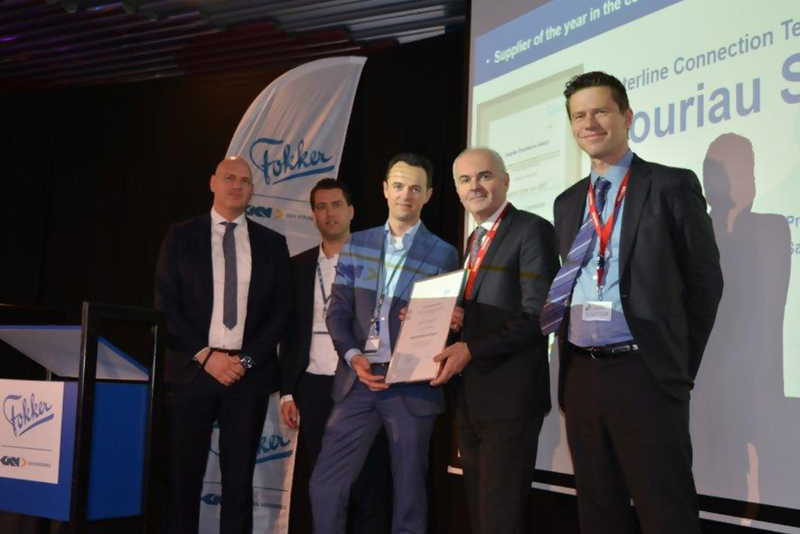 My thanks to you, dear Michiel Barendse, and let me say that this award is one encouragement more for all the personnel at SOURIAU to keep on providing you with the products and services that FOKKER needs from us.